When your newborn arrives, you want to give him/her everything that he/she needs to be comfortable, safe and loved. When it comes to finding the best toys for newborns, you will find some to be appropriate, some not and some simply THE BEST. Best toys for Newborns? Really? Let’s be honest here. Newborns don’t really need a toy. They can be just as entertained looking at a motionless table leg as looking at a $500 toy with all the latest gadgets. More importantly, their brains develop faster when they are looking at…guess what? Your own face! YOU are probably their biggest toy. However, this does not mean that you shouldn’t invest in toys. You MUST. Why? Because these toys will give you a BREAK, buy you some time to have a shower and help you retain some sanity. These toys are more like lifesavers. So yes, these toys are more for YOU than for your newborn. But a happy mommy is a happy baby. So make sure that you add these to your shopping or baby shower list if you haven’t already! Now, why did we select these toys specifically? Because they are not only age-appropriate but also will help in your newborn’s development stage. Newborns are generally defined by the medical profession as being between the age of birth to 28 days. During this time, a newborn is truly helpless. They cannot feed themselves, they don’t know how to burp themselves and they may need help learning how to put themselves to sleep. They will be lying on their back most of the time when they are not being held by you. You can start tummy time with them right after delivery to start strengthening their necks and back. They can only see to about 14 inches away (the length of about 3 iPhones). However, their hearing is very sensitive and they love the sound of your voice because it’s one of the familiar qualities that they will recognize from their time in your womb. Because of this, some toys are better for newborns than others. What makes a toy best for newborns? Toys that have strong contrasting colors (like white and black) are the best options for newborns. On top of this, any toy that encourages you to talk to them or sing to them will be helpful. The more you engage with newborns, the better it is for their development. Having said this, you will still be exhausted from your heroic delivery, possibly still aching in your body, juggling breastfeeding or formula feeding and sleep-deprived. Any toy that can engage your newborn for at least 5 minutes so that you can brush your teeth or simply go to the toilet will feel like God-sent, trust me. Because of this, consider getting a toy that won’t need you to be physically present to operate it. Remember that a newborn’s fingers and toes are still curled up so they won’t have any finger strength to grasp or hold any toy. So any toy that needs to be held by you will be less helpful than one that they can play with by themselves. For example, toys that dangle above your newborn are absolutely fabulous because you don’t need to be around to hold the toy for them. Based on your newborn’s development, we recommend these 10 toys that we feel are the best for your newborn. We love, love play gyms! They are an absolute MUST for any newborn. If you can, get more than one. Put one in every room that you intend to place your newborn and you will save time having to move the play gym around. Not only are play gyms great for newborns as newborns spend most of their time lying down on their back, but it’s also great for tummy time as the hanging toys encourage them to look up. The hanging toys in a play gym will also encourage your newborn to use his or her hand to bat or grasp at the toys. When your newborn gets more mobile, they will probably even try to use their legs to kick at the toys! If you have a few different play gyms, you can move around and interchange the hanging toys to keep things interesting for your newborn. The more variety of hanging toys that you have in a play gym, the longer your newborn will be engaged. 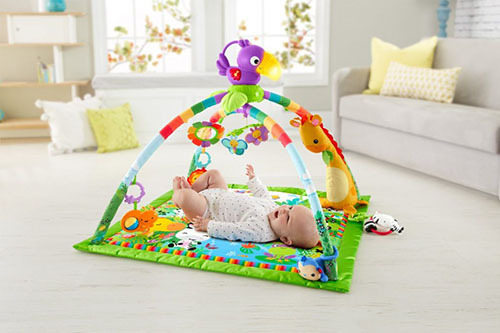 If you are searching for a play gym, we recommend that you get the Fisher-Price Music and Lights Deluxe Gym, Rainforest. 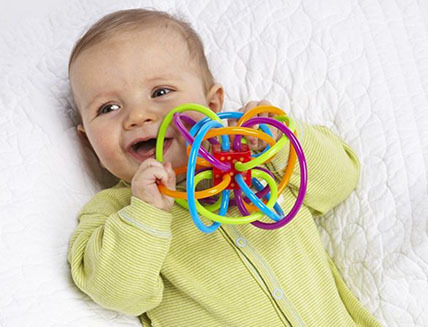 It has an amazing variety of toys to interest and capture your newborn’s attention. It has a musical toucan that has dancing lights that you can disconnect to take with you or use for sleep time music. 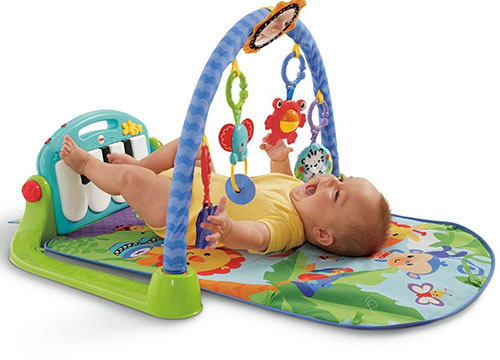 The play gym also comes with a range of hanging and non-hanging toys for your newborn to interact with. In addition, the mat has a variety of textures to help your newborn develop his or her sense of touch. On top of all of this, there is an adorable, detachable giraffe that is large enough that it could double up as a soft toy for your newborn! This Deluxe Gym has music and lights that activate from your newborn’s kicks and movements and this also teaches them about cause and effect. You can even set the musical toucan to long-play mode and it plays music for 20 minutes! All the toys are detachable so that your newborn can play with them during tummy time. And it comes with a mirror for your newborn to look at. Yes, it’s true, newborns love looking at their own face in the mirror! In our opinion, it is simply the BEST. This Deluxe Gym should go on your MUST BUY list! 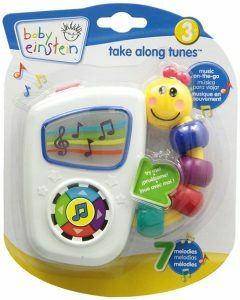 If you ever wanted your baby to develop musical skills, you will love this toy! Not only does it combine the engaging magic of a play gym but it has a step-on piano for your newborn’s little feet to kick at! One tap on a piano key plays an entire tune so you don’t have to worry if your newborn is not a great piano player yet! Our selected newborn tester for this toy was an amazing kicker right from the start. As she got used to it, she worked out that every tap on the piano played a tune and she sometimes went wild for 30 minutes with her ‘piano playing’. This, of course, meant valuable time for our mommy tester to get stuff done! Another very useful aspect of this Piano Gym is the hanging toys and mirror. The hanging toys will help your baby to develop their fingers and leg co-ordination at the same time. The mirror adds another dimension of engagement for your newborn. You can also let your newborn do tummy time on the mat. 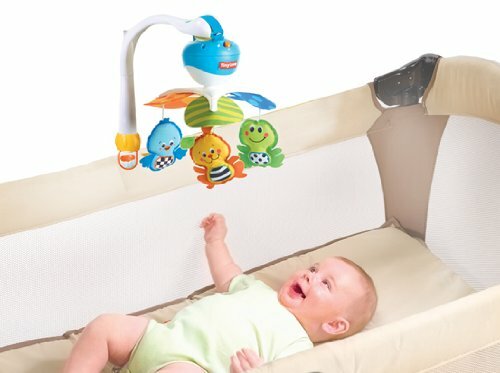 The hanging toys can be disconnected and placed on the mat so that your newborn can look at them. When our newborn tester finally acquired sufficient neck strength to look up during tummy time, she really loved looking up to play with the hanging toys! All these awesome parts of the Piano Gym, Kick and Play bought our mom tester some valuable time to get some chores done. On top of this, as your newborn gets older and can sit up, the piano part can be disconnected from the rest of the play gym so that your newborn can use their hands to play it as well! Cradle swings are another must for newborns. Why? Your little one has been used to being rocked to sleep for 9 months in your tummy. It is not surprising that he or she demands the same after birth. However, unless you are a weightlifter or aspiring to be one, you will eventually tire of holding and rocking your newborn. In our opinion, the Fisher-Price Papasan Cradle Swing is the queen (and king) of all cradle swings. 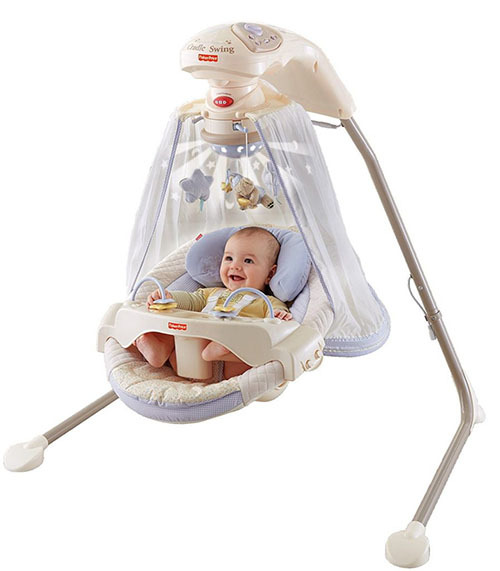 Not only does it have two singing motions (side to side and head-to-toe), 6 swing speeds, two recline positions with 3 adjustable seat positions (right-facing, center and left-facing), 16 choices of songs (8 day time songs, 8 night time songs and 2 longer songs), soothing nature sounds, a removable tray and hanging toys but it also has a surrounding canopy and overhead starlight show! Did we say that it was the king and queen of all cradle swings? We like the removable tray because it provides another layer of security for a boisterous, active child. But most of all, we like the canopy because it provides a feeling of enclosure that newborns like. If you are looking for a top-notch cradle swing that will engage your newborn for a longer period of time, this is it! A mobile crib toy was the first toy that helped our mommy tester retain sanity during the first few weeks after birth. Not only will your newborn spend a lot of time sleeping in his or her bassinet or crib but because newborns spend most of their early weeks lying down, a mobile crib toy is essential not only for their entertainment but also for their development. Making this, one of the best in the best toys for newborns. The Tiny Love Take-Along Mobile is a relatively straightforward mobile with not a huge variety of toys but it is a great start for a newborn. There are black and white geometric designs on the hanging toys for newborn eyes. However, it is especially fantastic because it triples as a mobile crib toy, a car-seat toy and a stroller toy. Yes, it is a great value! The mobile rotates as well as plays 30 minutes of continuous music. This is useful as your newborn may be contented to listen to the music and let you have some time to yourself. Even better if the music puts them to sleep too! Some newborns love being in a car seat, most absolutely hate it. Unless you intend to sit in the back seat of the car all the time to soothe your newborn (and get someone else to drive), you probably will find yourself looking for something to entertain your newborn in the car seat. We personally love the Tiny Love Take-Along Arch, My Nature Pals Stroll because it has a flexible arch that allows you to adjust it to suit your newborn. It also has lots of cool toys on the arch itself including a spinning bead ball, crinkly frog, flower mirror and propeller that can be activated by your little one when he or she acquires sufficient hand strength. Compared to other car seat toy bars, this one has a lot going for it and is very effective in calming a screaming baby. Not to mention that it also can be used in a stroller which is of course, awesome! This toy may seem really simple and basic in nature but don’t underestimate its effectiveness. The manufacturer put some thought into this toy and this is evident in it winning the Oppenheim Toy Portfolio Gold Seal Award 2013. Its multiple layers of multicolored thin tubes are great for small newborn fingers. Newborns love music and when your newborn obtains more hand strength, he or she can start shaking it to produce the rattle sound too. It is also very newborn-friendly and safe because it has no parts that stick out, is BPA free and safe to be chewed on when your little one eventually starts teething. Let us share another secret use for this toy-it can also double up as a hanging toy in a play gym! You may be one of those parents that do not leave the house for the first few weeks after your newborn’s birth. Or you may be one of those parents that are itching to go out and get a cup of coffee right from the minute you are home from the hospital. Either way, every parent eventually needs to leave the home with their newborn in tow, whether it’s for a pediatrician’s appointment or simply to get some groceries. Because of this, you need a take-along toy that is small and light enough to fit in your handbag or diaper bag. 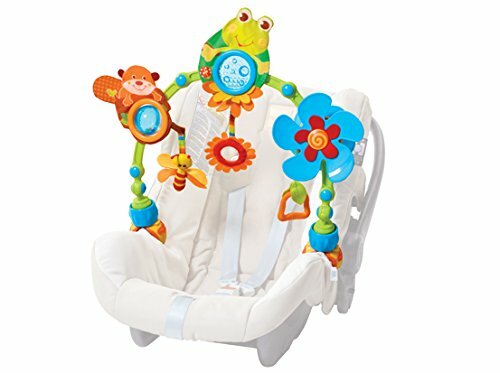 Because of this, we recommend the Baby Einstein Take-Along Tunes Musical Toy that plays 7 well-known classical songs with dancing lights. Don’t be afraid to sing along, your newborn will love hearing you, even if you sing out of tune! Remember we mentioned earlier that it’s important to provide a variety of items with different textures and sounds to help your newborn develop their senses? 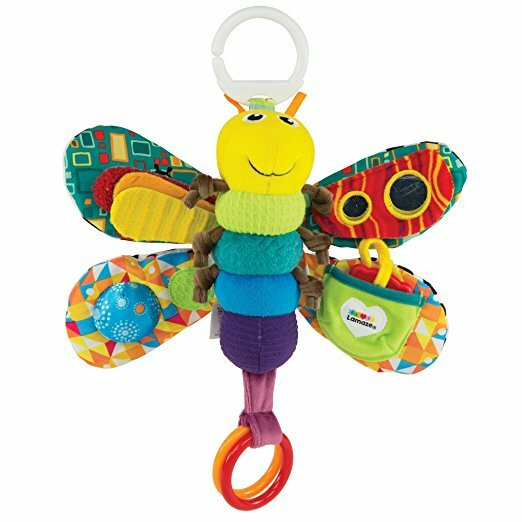 Well, the Lamaze Freddie The Firefly has all kinds of textures and sounds in one small, easy-to-carry toy. It has a myriad of colors, a small mirror, rings, a variety of textures, jingles and even comes with a teether too! We bet that this toy will probably be another favorite take-along toy! This toy is recommended for 6 months and above but we think you will find it useful for newborns too. Experts recommend that you start reading to your newborn from birth as it’s great for bonding between parent and child and creating a habit of reading to your child. Remember that we also mentioned earlier that your newborn loves the sound of your voice? Well, the VTech Rhyme and Discover Book has easy tunes that allow you to sing along and not feel too awkward. Isn’t that a plus? On top of this, rhymes are another way to introduce similar sounding words to your newborn. Reading to your newborn becomes a lot more fun if you actually enjoy reading the book yourself. We like this book because it is funny and has a twist at the end. 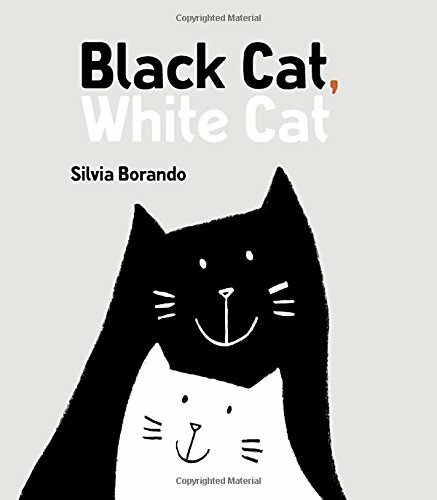 It comes in black and white, with simple pictures which is perfect for a newborn. So there you have it, the 10 best toys for newborns.